Is it me or is there something a bit rich about the so-called ratings agencies - Moody's, Fitch and Standard & Poor's - threatening to downgrade Ireland's credit status. Are these not the same geniuses who graded 'toxic waste' as triple-A top grade products for investment? I would have thought the words 'toxic' and 'waste' (regularly used by those in the industry to describe what they were selling) were fairly strong clues to the true nature of what was being sold? The credit rating agencies are US regulator empowered bodies - or Nationally Recognized Statistical Rating Organizations (NRSROs) - and so can be dis-empowered as well. Worryingly they are supervised by the SEC - another organisation that hasn't exactly covered itself in glory. It's even worse than the Madoff debacle according to some. Moody’s and S&P should be banned from the rating business. They proved that a AAA rating could be bought. Pension plans, governments, companies, and individuals relied on their ratings. They colluded with the investment banks and must be punished. Their monopoly needs to be ended. We appears to be days or weeks away from the news that Ireland has been downgraded from AAA by one or more of the ratings agencies. Though as the chart shows we are not as exposed as countries such as the UK (though an earlier version of the chart, since corrected, had me much more worried!) Nevertheless, I don't think discredited organisations should be allowed to wield that much power and to lumber me, my children and grand children with the extra cost of servicing the national debt. They are unfit for purpose: definitely grade C or D.
I like to meditate - usually a form of Vipassana meditation from the Therevada Buddhist tradition. It's a good way to start the day, and to unload the anxieties of the previous day. I've long had a deep affection and respect for Buddhist philosophies and teachings: of all the world's faiths it seems to be the most advanced in figuring out how to live well in the world as it is. Yet I often find myself disagreeing with many Buddhists about their views on the nature of the economy or modernity or the West. Take Pankaj Mishra, author of An End to Suffering: The Buddha in the World - there's an excellent interview with him over at Speaking of Faith. Mishra argues that Western capitalism has effectively lead to more suffering (spiritual and emotional replacing physical amidst our material comfort), and therefore is in many regards a 'wrong path' for humans to follow. It's a common enough argument by free markets critics, e.g. : socialists and environmentalists, and not just religious aesthetes. Mishra's is a journalist's perspective: but some have applied a Buddhist critique to modernity from an economics perspective. One such paper I read recently was that on Happiness and Economics: A Buddhist Perspective (pdf) by Colin Ash. He combines an interesting mix of insights into neuro-economics and Buddhist philosophy to suggest that Capitalism merely tricks us into pursuing 'the end of the rainbow' - or happiness - with the result we are doomed to continually experience suffering (or dukkha in the Buddhist lexicon) as we will never get there. For evidence Ash refers to survey data showing diminishing (even negative) returns to increasing economic affluence in the form of self-reported happiness across populations. Unfortunately he puts rather too much faith in such data, despite the numerous problems with such measures as I've noted before. Curiously, as the use of comparative international surveys to determine the nature and drivers of well being have advanced, the case for economic growth being on a balance a good thing for happiness appears to be getting stronger. 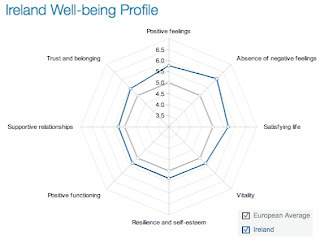 Take Ireland: as the chart shows, on most of the critical measures of the Irish people's wellbeing - trust, relationships, vitality etc - we are doing much better than the EU average. And that's according to a new study on the National Accounts of Well-Being by the determinedly anti-capitalist New Economics Foundation. Or take the findings from the United States that 'happiness inequality' between the well off and the less well off has actually declined since the 1970s. So does a Buddhist understanding of economics - Buddhanomics - have nothing to teach us? On the contrary, I think there is a powerful synergy between the philosophical insights of Buddhism and those of Western traditions that have given rise to free market democracies. For example, if I compare the Noble Eightfold Path of Buddhism with something far more recent like the Ten Conservative Principles of the past two hundred years of Western philosophy, then I am struck by their many points of agreement. The Permanence of a society is formed by those enduring interests and convictions that gives us stability and continuity; without that Permanence, the fountains of the great deep are broken up, society slipping into anarchy. The Progression in a society is that spirit and that body of talents which urge us on to prudent reform and improvement; without that Progression, a people stagnate. We shall once more value ends above means and prefer the good to the useful. We shall honour those who can teach us how to pluck the hour and the day virtuously and well, the delightful people who are capable of taking direct enjoyment in things, the lilies of the field who toil not, neither do they spin. Ultimately it will be the combination of the liberating power of free markets and the resilience that comes from self-awareness that will get us through this recession and on to a path of recovery. And on that note I'm going to go sit on my zafu and do absolutely nothing for a while. 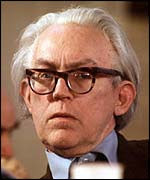 I'm beginning to wonder if Fintan O'Toole is channelling Michael Foot? Fintan's latest idea for how we get out of the current economic mess is to introduce a maximum wage - he suggests €80,000. And to help things along he wants to introduce price controls, abolish the provision of private pre-school and healthcare services, and get rid of various unnecessary tax reliefs (in Fintan's opinion). I was reminded by his screed of another, even crazier set of proposals. It was the UK Labour Party's 1983 election manifesto, then led by Michael Foot. It subsequently became known as the longest suicide note in history. The British people, to their credit, ran a million miles from nonsense about 'seizing the commanding heights of the economy' into the arms of Margaret Thatcher. The rest is history, as they say. The basis for Fintan's proposal is the observation that 'The first step is to recognise that the divisions in the Irish workforce are not between public and private, but between those who are comfortable and those who are struggling.' In this he is completely wrong. In fact, the single biggest division in the Irish workforce is between those employed in the public sector and those (still just) employed in the private sector. As an analysis by Finfacts yesterday points out, quoting ESRI research, the gap between public sector wages and private sector wages in Ireland (the latter being on average 20% below the former) is the highest in Europe. Our politicians are also amongst the highest paid the world. We desperately need new thinking about how to get us out of the current situation. Though it is not the bolshevism-lite of Fintan O'Toole and Cori that we need, but rather something far more ambitious and more likely to succeed. And that is empowering thousands and millions of people to invest their energy, money, time and dreams in building and expanding the businesses that will create the wealth and employment that will secure our future standard of living. As well as generating the incomes and profits that our political masters can then tax to spend so much more effectively than you and I. Michael wouldn't approve, but Margaret would. I suggest that the real objective of Socialism is not happiness. Happiness hitherto has been a by-product, and for all we know it may always remain so. The real objective of Socialism is human brotherhood. This is widely felt to be the case, though it is not usually said, or not said loudly enough. Men use up their lives in heart-breaking political struggles, or get themselves killed in civil wars, or tortured in the secret prisons of the Gestapo, not in order to establish some central-heated, air-conditioned, strip-lighted Paradise, but because they want a world in which human beings love one another instead of swindling and murdering one another. And they want that world as a first step. Where they go from there is not so certain, and the attempt to foresee it in detail merely confuses the issue. If he had been editor of Marx's Das Kapital then communism might actually have succeeded (though I doubt Orwell would have welcomed that). Luckily he wasn't, and we got the dense verbiage of Volume 1 instead (I hadn't the heart to read Volume 2 having endured the former). But there's a problem with human brotherhood as a motive: it doesn't scale. We can love our family or our favourite football team, but there's a limit to how much such motives can be relied upon. As Eric Raymond says in a fascinating interview over at Econtalk, "love doesn't scale". And he's talking as a founder member of the 'hacker' community of software developers who have brought us Linux, Wikipedia, Firefox (which I'm using) and so on. Indeed, the speed and scope of free software development is quite amazing. Best read the original post for the details. But it strikes me that it's not a bad menu for Irish businesses and innovators to work through in order to identify the opportunities for growth and profit that will contribute to recovery. 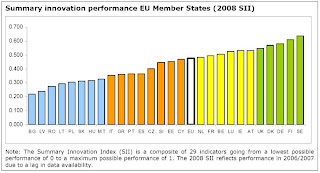 And the good news, for a change, is that Ireland is reckoned to be a 'growth leader' among the 'innovation follower' nations in the EU - that's according to the European Innovation Scoreboard 2008 (pdf): summary chart above. Despite their failures however, free markets have lifted more people out of poverty and helped create prosperity and peace better than any system ever devised. So much so that even in today’s financial downturn, as hard as it may be, very few people who live in mature market economies are completely without resources or on the brink of starvation. 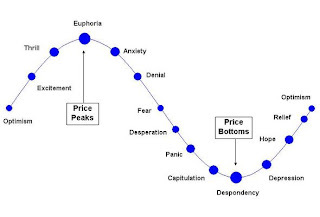 Notice that markets are often blamed for the downturns, yet we tend to forget the cause of the upturn. The dream of 'a world in which human beings love one another instead of swindling and murdering one another' will be brought closer by letting them trade with one another instead. We don't do jackboots in Ireland; we do lawsuits instead. The outcome, at least in the initial stages, is still the same: the suppression of dissent. Yesterday, The Irish Economy blog deleted a post referring to a story by UCD economist Morgan Kelly in the Irish Times 'on legal advice'. Even the Irish Times' Business Blog was moved to comment on the deletion, suggesting that it was time to Stand Up for Your Right to Be An Economist - with unfavourable comparisons to Latvia. They lean more towards the jackboot end of the spectrum there it seems. On the one hand this is an extremely trivial affair (who cares about another post on another blog and all that navel gazing? ); on the other, the incident strikes at the heart of academic freedom (as it is mainly academic economists who contribute to the blog). Ireland is still one of the freest countries in the world: but in these turbulent times it is even more incumbent on all of us who love freedom (Right and Left) to be ever more vigilant against the dissent-suppressing powers of the state and its acolytes. Before it goes any further. How right they both were. These are glorious times for socialists and the Left generally. Those paragons of capitalist excess, the banks, have been reduced to welfare queens queuing for their next taxpayer funded handout. No wonder the Left are gloating - I don't blame them. As it collapses, we see starkly what this era of capitalism created: a plutocracy that has accumulated unprecedented wealth. By contrast those on median incomes were cajoled, persuaded and seduced into piling up punishing levels of debt and putting an unprecedented amount of household labour (double earners became the norm) into insecure jobs. We are facing not just an economic crisis but a moral one also. What was the legitimacy of a system that pursued economic growth for its own sake with a wilful disregard for whether it produced a good life? It has resulted in the highest levels of inequality in a century and squandered our environment, communities and well being. Ireland bought into this scheme of things with enthusiasm. 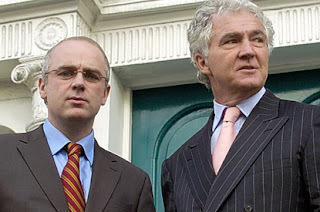 The Irish banks epitomised this embrace of Casino Capitalism. They engaged in too much mortgage lending (financed by heavy foreign borrowing) into an unsustainable housing price and construction boom. ... Ireland’s current abysmal position is the result of the pursuit of economic policies which were partly based on a now defunct economic model. This was the turbo-liberal economics of Thatcher and Reagan dominated by de-regulation, liberalisation and privatisation. This system has collapsed in a very short time, humiliatingly and with a bang. For the Left (and a few bishops and cardinals) 2009 is Capitalism's 1989 (when the USSR/Berlin Wall fell). Schadenfreude indeed. Naturally this has prompted demands for a huge expansion of the State through a mixture of Keynesian and plain-old-fashioned socialism. Michael Taft has set out an agenda for just this in the Irish Left Review (he has an excellent blog over at Notes on the Front). I've debated some of these issues with Michael (and Stephen Kinsella) recently via Slugger O'Toole - you can listen to it here. In fairness, it has to be said that some of the Left's analyses of how we got into the current mess are excellent: this paper from New Left Review by Peter Gowan is one of the best explanations of 'leverage madness' I have read so far. It's a little conspiratorial (the default setting for most on the Left), though I suspect on this occasion he might be right about the diagnosis (though not the prescription). But the fundamental problem for the Left is that the State cannot afford their ambitions. The banking crisis has seen to that. John Redwood has said about the UK situation: "The government has to avoid moving from a very serious problem of weak and overborrowed banks, to an even worse problem of a weak and overborrowed state." The Irish Government already has. Standard & Poor's lowered Spain's credit rating yesterday, Ireland's will follow this week or next (if not this afternoon). This is the central point about the bailout of Anglo Irish, and one that has not received any attention: the only effect of a bailout is that the Irish taxpayer will make up the losses of Anglo Irish’s bondholders instead of the insurers who had already been paid to underwrite the risk. Why it is necessary to transfer Anglo’s losses from the writers of Credit Default Swaps to the Irish taxpayer is something that the Government has not thought to justify. Indeed, what has been disturbing about the entire Anglo affair is that at no stage has the Government felt it necessary to explain why any bailout was needed, beyond inchoate mutterings about the “systemic importance” of Anglo Irish. The reality is that Anglo has no importance in the Irish financial system. It existed purely as a vehicle for a few politically connected individuals to place reckless bets on the commercial property market. These property speculators may be of systemic importance to the finances of Fianna Fáil, but their significance ends there. In ordinary times, piling €30 billion of Anglo Irish losses on to the national debt would be painful and pointless but not impossible. These however are not ordinary times. International debt markets are flooded with governments trying to borrow. The other Irish banks are dangerously short of capital. Most importantly, the Irish economy and government finances are collapsing. We will likely see the further nationalisation of other Irish banks in the coming days or weeks. This will be the biggest expansion of the power of the State since the Second World War. Though nationalisation may serve a necessary purpose in extremis, the ability of our current incumbents to do so successfully must be seriously in doubt. All of us concerned with our nation's future - Left, Right or Centre - must look on these latest developments with alarm and foreboding. Our capacity as a nation to steer our own future course is now being severely hamstrung by political incompetence rather than political ideology. Unlike bad weather, recessions are man-made phenomena and so they don't just end by themselves. Nevertheless this recession will end: though maybe not in the same way as others have in the past. There is a considerable body of economic literature on the causes of recessions and depressions, booms and busts. The literature on recovery from recessions is a lot thinner (other than a number of studies analysing the typical pattern of recession/recoveries). Typical is this study of the pattern of macroeconomic indicators preceding the end of the recession, which suggests that it really is darkest before the dawn (of recovery). I think one explanation for the absence of an extensive economic literature on recovery is that recessions are a driven by macroeconomic phenomena in the main, whereas recoveries are driven more by microeconomic phenomena. It is the decisions that go on within businesses and households that determine the timing, nature and scale of recovery - but these decisions don't lend themselves well to macroeconomic modelling. Focusing on demand in this way is like focusing on the sound of one hand clapping. The other hand is supply, and that is where the economic action really is. There are normal processes that launch a recovery and drive an economy. These processes involve individuals and businesses responding to opportunities and incentives. When they respond, these individuals and businesses produce more goods and services valued in the marketplace, simultaneously increasing production, demand, and income. An effective stimulus policy recognizes these economic processes and seeks to accelerate them. Lower marginal tax rates stimulate the economy because they improve the incentives facing individuals and businesses to work, invest, take risks, and seize opportunities. A real sense of emerging opportunities - either in the form of recovering export markets (the UK and USA in particular) and/or recovering consumer spending in Ireland. The former will depend on the nature and pace of others' economic recoveries, as well as the attractiveness of Irish produced goods and services in terms of price and quality to customers in those markets (factoring in the euro exchange rate). The latter will depend on the trend in unemployment: once people sense it isn't getting worse (and we're not there yet), then consumer confidence will cautiously return, and with it spending by those still in jobs (now more confident they will keep them). On the incentive side, taxes and labour legislation will be critical: taxes and laws that make it more expensive to hire and retain staff should be cut back or suspended forthwith. Similarly, incentives for R&D, training and trade development should be provided, ideally in the form of tax cuts and allowances (rather than direct government spending as this will only add to the need for borrowing). The banks need to be sorted (nationalisation, toxic warehouse, state insurance - take your pick but sort it out), and they need to start making profits that encourage them to expand their loan books: otherwise recovery will be stalled. But I think we need to go further. We need a different type of recovery process for a different type of recession (one whose principle cause was a banking crisis rather than a cyclical downturn in trade on its own, though we're getting that as well now). I'm calling it Recovery 2.0, which like the eponymous Web 2.0, points to a new paradigm in how we can and should go about facilitating recovery this time round. Freelancing - if you can't be an employee be a sub-contractor: better to have lots of bosses (called clients) because if one lets you go then there are others to keep you occupied. Networking - it's all about who you know: and the likes of Facebook and LinkedIn make it easier than ever to get in touch, stay in touch and be connected with potential customers and suppliers. Discovering - using the web to conduct ultra cheap (even free) research to find out what consumers and businesses want, anywhere. Innovating - as I've noted once or twice before, innovation has been democratized: the tools are now available to co-create solutions to a wider range of problems than ever before. Recoveries like recessions are usually under way long before they appear in the official data. So will the forthcoming recovery. But it will be different from the past. I foresee a combination of orthodox factors (falling costs, rising confidence) and unorthodox factors (Web 2.0 applied to innovation) putting us on the road to recovery. While there is much outside of the control of those of us in Ireland (Government, businesses and citizens), there remains much that is in our control. By working harder and working smarter we can the leverage we've got to get us on the road to recovery sooner rather than later. Will savers save the banks? I've posed the question before - BCC: before the credit crunch. 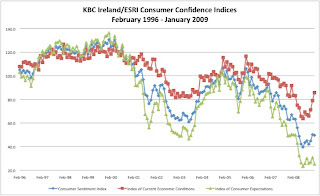 The latest Quarterly Economic Commentary from the ESRI is projecting the level of personal savings will more than double from €3.6 billion in 2007 to €8.3 billion in 2009. I suspect it will go higher, not least because of the 'precautionary motive' now driving consumer attitudes towards spending and saving. 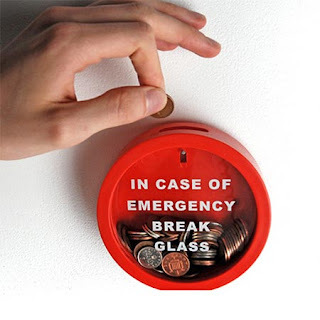 Interest rates are academic: preservation of capital and access to an emergency fund in the event of a job loss are the dominant drivers of savings behaviour at present. This means that the banks will experience a massive inflow of resources over the coming months and years. Inflows that will likely dwarf any injections by the Government as part of any (more) bailouts. The same is happening in the United States, by the way, leading some commentators to suggest that the uptick in US savings is bad news for China and others enjoying trading surpluses with America. Should the Government go further and set out to deliberately stimulate savings? I'm not sure: I'm no Keynesian but it is fairly obvious that if you encourage consumers not to spend then you end up with a sharper contraction in aggregate demand than is inevitable or desirable (the key point in a fascinating interview with Steve Fazzari over at Econtalk). On the other hand, it certainly could be a relatively painful way to help the banks get out of their current mess and to restore their tier 1 capital ratios and balance sheets. I have some sympathy with the Irish Congress of Trade Union's call for a National Recovery Bond, a revamped form of the SSIA (something I suggested before myself). And I certainly would like to see an end to the 'corporate welfare' that they highlight. Needless to say I disagree fundamentally with their thoughts on raising income taxes. But taxation could play a part: I'd like to see the Government suspend DIRT - deposit interest retention tax - for a period of 3 years, if only to provide some support for those people (usually pensioners) who rely on interest from savings as a critical part of their income. Something they're not getting a lot off right now - nor are likely to for the foreseeable future. The Government has made me a part owner of Anglo Irish Bank. Gee thanks, just what I wanted for Christmas. The usual excuse of the potential for 'systemic risk' have been trotted out. As usual there is zero transparency about how much failure we are talking about. The quote from Buiter is more than apt in the circumstances. How much am I now liable for (along with other citizen-taxpayers)? Anglo are reported as having liabilities in the order of some €100 billion. If 20% of that goes bad (the typical experience of US property busts on banks according to Morgan Kelly) then we're looking at writing off some €20 billion. That's equivalent to the Government's budget deficit this year. Kelly points out that 20% is the 'optimistic' scenario for Ireland. It is extraordinary that a democratically elected Government is taking on these liabilities - which will have no benefits and only costs to the taxpayer - without any detailed explanation to its citizens of the origins, nature and scale of the risks involved. I guess the FT is right: this is how things fall apart. 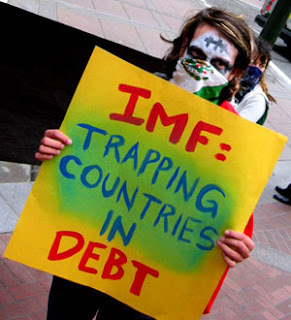 Yesterday's story about the IMF that wasn't had me wondering whether the clowns have taken over the circus? Seriously, this is not how you run a country plunging into a recession. RTE's Prime Time show on the economy last night subjected us to a lot of inevitable doom and gloom, with a small crumb of hope to lighten the mood. The question that kept being asked was 'what should the Government do?' Everyone had a stab at an answer. But none gave the answer I'd give which is: 'put your own house in order and just get out of the way of the private sector'. Remember, this is the Government that has brought us de-centralisation and electronic voting. The structure of government and the electoral process are areas they are directly responsible for. And they've made a mess of them. So why entrust the Government to do a better job in the areas it isn't responsible for: like delivering communications services, developing software, investing in manufacturing? They can't and they won't. Which is why I have a problem with five year plans and such like (despite the calls of many of the participants in Prime Time for a plan). You can't 'plan' a modern economy: there are too many players, factors, barriers and unknowns in the way of any illusory attempt at describing a future path for the economy as a whole, let alone one that the Government will somehow deliver. And maybe the folk in RTE should take it too, just avoid any more non-stories about the IMF and subsequent runs on the euro. That's the subject of a recent interview over at Speaking of Faith with one of my favourite writers: Jennifer Michael Hecht. In the interview she discusses her book Doubt: A History, and the various philosophies and religions that emerged over the millennia in response to the big question (and others). I like her take on religion - though she's a doubter not a believer, she rejects the labels atheist or agnostic as too restricting. Life is too full of mystery - from the universe we occupy to the nature of consciousness - to be totally dismissive of religion. After all, religions in all their manifestations are a response to mystery. And mystery will always be with us. The list of possible general moral and ethical principles are seemingly unending. These include Platonism wherein it is generally held that if we knew what the good life was, we would naturally act in such a way as to try to attain it; Aristotle’s doctrine which states that the good life is a life of happiness in which we must always act so as to attain the mean between two extremes; hedonism which depicts pleasure as the sole good; cynicism which exhorts us to reject the fruits of civilization and return to a simple ascetic living; stoicism which prescribes that a man ought to be indifferent to events happening outside of himself; quietism which is an oriental ethical principle that enjoins us to succumb and accept adversity; Spinoza’s ethical dictum which is that happiness stems from an understanding of the limits of human power. The calculus of utilitarianism is the paradigm by which an action is considered good by the extent to which it produces excess of beneficial effects over harmful ones. Kant’s formulation is based on a dualism that a moral act is one undertaken from a respect for duty, not from inclination or even in accord with duty and that we must always act such that as if such action were to become a universal law. Though I'd suggest you check out some of the original texts for yourself - starting with Hecht's book perhaps. It seems to be the destiny of our species to keep coming back to the question of 'how should we live' over and over again. And to bring it right up to date, check out this delightful (and very funny) short video called Be Good, which gives a very 21st century take on answering the big question. It happens to be part of the superb Responsibility Project that I have mentioned before. 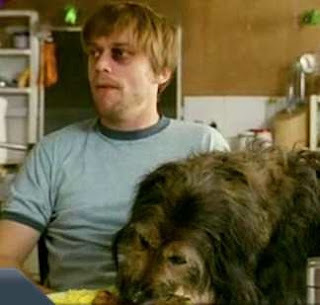 Maybe I should get a dog ...? A small cause for celebration in these gloomy times: the 2009 Index of Economic Freedom just published ranks Ireland the fourth freest country in the world. The full Irish results here. As I noted before, we wear our freedom lightly in Ireland, taking it somewhat for granted. This is foolish - dangerous even. Looking at the data for Ireland in the chart it is clear that we are below the global average already for fiscal freedom and Government size. 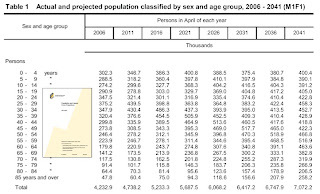 But as the 2009 report points out, both these measures are expected to deteriorate in Ireland this year. We may be at the peak of economic freedom in our country. I hope not. That's quite a list. All the more reason to defend and expand the freedoms we enjoy. After all, that is why we became a Republic in the first place. I was at the Responding to the Crisis conference this afternoon - organised by UCD and the Dublin Economic Workshop (papers at the conference site). Well done everyone involved in organising it. Two things struck me about the various contributions: 1) there was a lot of hindsight wisdom in the analyses; and 2) the consensus is that things will get a lot worse, and possibly go way beyond worse. The contribution from Morgan Kelly easily won the Nouriel Roubini Prize for gloomiest presentation (with talk of 80% house price falls and Anglo/Irish Nationwide stiffing the Irish taxpayer for €30 billion). On balance there wasn't that much 'Response' in evidence from the bulk of the contributions. Instead there was too much diagnosis, a modicum of prognosis and not enough prescription. A pity really. I only hope the organisers are planning a sequel using open space technology or similar to get the collective inputs of the 200 attendees next time round. And way less PowerPoint. ... much of the current global rethinking of regulatory design will not necessarily be particularly relevant to the Irish scene: the Irish problems relate to a very old-fashioned credit boom and not to financial innovation. The failure was one of insufficient scepticism on the part of the regulator. With hindsight, it seems evident that the Regulator should have insisted on much more pessimistic loan-loss provisioning on developer loans. The adjustment to capital requirements for high LTV residential mortgages should have been much higher. Beyond that, the danger to be avoided now is that the Regulator might be inclined to impose requirements that discourage exactly the lending that is needed to protect the economy through the downturn and position it for a recovery. Horse-stable-bolted. But he's right: we don't want to shoot the horses that are left to in order to punish the ones that got away. We are constantly being told that the current economic problems are akin to the Great Depression, or that credit crunch was as significant a blow to capitalism as the fall of the Soviet Empire was to communism. But these things are simply not true. Unemployment isn't going to reach 25 percent. People aren't going to starve. The stock market is going to recover. And capitalism itself isn't going anywhere. Whatever happens, people will continue to make things, sell things, and buy things. People will continue to innovate, and others will continue to invest. Free exchange will go on. And that, ultimately, is what capitalism is. It isn't a system or a structure like the planned Soviet economies. It is a collection of free individuals pursuing their interests, and that's what makes it so dynamic and resilient. It might take time, but markets adjust, and ordinary service is resumed. 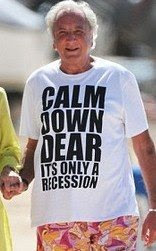 Maybe we should issue every Irish economist with a Michael Winner t-shirt? POSTSCRIPT: handy summary of all the talks written by Stephen Kinsella (UL's Paul Krugman ;-) here. Economic collapse often has the character of a cumulative process. Let it go beyond a certain point, and it will tend for a time to gain strength from its own development as its effects spread and return to intensify the process of collapse. Because no great strength would be required to hold back the rock that starts a landslide, it does not follow that the landslide will not be of major proportions. We won't have an economic recovery in Ireland until the banks are sorted. All bets are off with regard to Government borrowing, private investment and economic growth until then. But like the proverbial elephant in the room, it is the issue that keeps being ignored by many commentators on Ireland's economic prospects. Even the Government appears to be in denial about it. In a curious, 11 page Addendum to the Stability Programme Update last week, the Government set out its view on how bad things are going to get over the next five years. The table above is from page 10. It shows the General Government Debt to GDP ratio rising from 40% last year (and 25% in 2007) to over 66% in 2012. A seemingly open (and widely welcome) admission of the need for government borrowing (and spending) to make up some of the shortfall in aggregate demand in the economy. We note that the government has also extended guarantees to seven domestic credit institutions through Sept. 29, 2010, increasing general government guaranteed debt to an estimated 228% of GDP in 2009. Banking system exposure to the property and construction sector of about one-third of total loans (excluding interbank lending) suggests a high risk of asset deterioration at these institutions. Hmm ... the Department of Finance says 53%; S&P says 228%. I wonder which one the markets will believe? Actually, we know the answer already: the rate on Irish Government bonds is now higher than those economic power houses: Italy and Portugal. And that's only the start: the world's governments are expected to issue $2,000 billion in bonds this year - it's going to get very crowded for countries like Ireland with, to put it mildly, a high degree of uncertainty about future government indebtedness. My worry is that we risk an experiment called 'Economic Depression in One Country' even as the rest of the world makes its way to recovery. Why? Without the Irish banks being 'right sized' in terms of their balance sheets and credit ratings, then the normal expansion of lending that accompanies recovery simply won't happen. It gets worse. Normally, borrowing and spending by governments is associated with a multiplier effect: for every euro the Government spends on, say, road building there might be another euro (or two) of additional economic activity created by downstream and ancillary activities etc. The same goes for tax cuts. But when it comes to government spending on the banks (currently running at €5.5 billion) it is quite possible that the fiscal multiplier is less than one, or even (cover your eyes) negative. For example, if the effect of the Government putting money into the banks is that they prioritise repaying the Government (and loosening the chains of direct control) over normal lending then they might actually lend even less than they would otherwise ... Tyler Cowen's eight reasons why we are in a depression would seem especially apt for Ireland in such circumstances. All the more reason to sort the banks out quickly. Everything else is whistling in the dark until we do. I was on Newstalk Radio's Down to Business show with Mark Mortell earlier. We talked mostly about consumer debt and spending - and the prospects for the latter in the year ahead. It struck me afterwards that recession and recovery have one thing in common: we usually only know they have started after the fact. So I suspect we'll be talking about the prospects for recovery for some time after it has actually started. Not that I think we're there yet: not by a long shot. Still, I was also wondering about what will bring about a recovery. Inevitably you think of the macroeconomic stuff (interest rates, unemployment, lending, investment). This matters of course, up to a point. But it struck me that the last time we had double-digit unemployment (1997) the economy was booming. Yet here we are heading towards double-digit unemployment again and the economy is shrinking. Of course, we are at a different stage in the economic cycle. And so we are experiencing a different set of emotions, individually and collectively. Some emotions are social: they are heightened by the company of others. 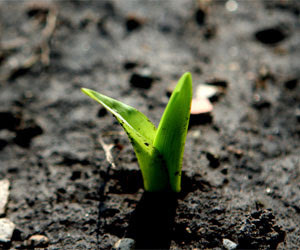 Fear is a social emotion; whereas hope tends to be independent of others. For that reason the story of recovery is a microeconomic story in the main. Recovery will arise from the discrete decisions and actions of thousands of business people, entrepreneurs, bank managers and workers deciding they are hopeful for the future and prepared to take the risk of borrowing/lending, investing and hiring to meet the needs they foresee. It is not up to Government or economists or the Social Partners to bring about growth: they just have to get out of the way of those who will. Nevertheless, it is usually the case that one sector or another leads the recovery. It is certainly the case that different technologies have emerged out of recessions in the past and thrived in the boom that followed. Colour television thrived during the oil crisis in the 1970s; VCRs during the turbulence of the early 1990s. Mobiles boomed after the dot com bust. The obvious candidate this time round is gaming. Deloitte have reported that a quarter of all UK households own a Wii gaming console: and the same proportion again intend buying one over the next year. The trend is lead not by teenagers but by families and silver gamers. The result, according to this stunning presentation, is that gaming is bigger than movies, DVDs, music and books combined. I'm still trying to get my head around that. Ireland is well placed to benefit from this trend. 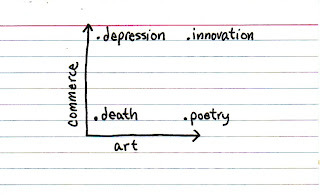 The little image above from the delightful Indexed captures it well: innovation is a fusion of commerce and art. We can be world class at both. And as I've said before (quoting Oscar Wilde) the future is what artists are - there's something to be hopeful about. It won't make the headlines, but I've been told to expect some 2,500 job losses in Ireland's International Financial Services Centre during the course of the recession now underway. About a tenth of all those employed there. That's bigger than Dell going from Limerick. The IFSC has been an extraordinary success story. 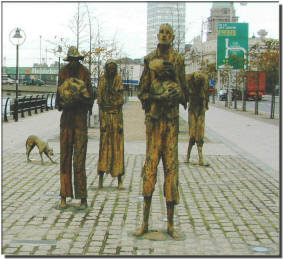 Not just in terms of employment and the economy, but more widely in terms of the geography of Dublin City, our culture, demography and our international reputation. We owe it much (and those who imagined and created it). Which is why the inevitable demise of the IFSC is something to concerned about - and planned for. Finance is global, banks are global (or about 50 of them are) but regulation is national. Whenever the span of the market and the domain of mobility of financial institutions exceed the span of control of the regulator, you will, sooner or later, have a mess. Every country wants to have an internationally active financial sector in its jurisdiction. The financial sector is clean, green, employs women as well as men, produces jobs, profits and taxes and gives good parties. National regulatory standards have been used as an instrument to compete for financial sector business – to attract it from abroad and/or to stop it from leaving for pastures new. Regulatory arbitrage is a game the financial market players know as well as tax arbitrage. The result has been a regulatory race to the bottom – soft-touch regulation rather than light-touch regulation. Both CGT and Corporation Tax allow the taxpayer to roll forward losses. These taxes may not recover for many years given the scale of losses now available. In the IFSC sector, some international banks have lost so much money that they may not have any incentive to minimise Corporation Tax liabilities for a decade or more - why locate in a high-cost (if low-tax) jurisdiction? Ireland’s key incentive (or compensation for high costs if you prefer) has lost potency in a world of large carry-forward losses. So we have a problem with the IFSC: the best case scenario is a gradual demise in its status and 'weight' in the Irish economy, with the slack taken up by the expansion of other, internationally traded services (computer games everyone?) Worst case scenario: a rapid hollowing out of the IFSC, driven by increasingly hostile attitudes in the United States and elsewhere to regulatory arbitrage. I keep ticking off the petrol price reductions as I drive around. The lowest I've seen - so far - is €0.94 a litre. Long may it continue. Though it won't. The collapse in oil prices during the second half of 2008 caught everyone by surprise (including me: I switched to a diesel car in June on the strength of rapidly rising prices!). This means that we can expect to see continuing falls in the Irish (and EU and US) inflation rates right throught to the middle of next year and possibly beyond as year-on-year fuel price comparisons drag the headline index down. But the other half of the oil price story is what happened in the first half of 2008: something like a 50% increase in the price of a barrel. What was that all about? 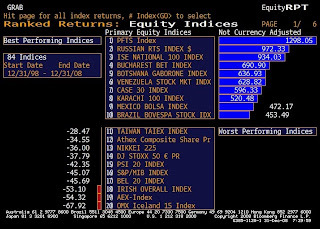 Some of it was speculation - part of the great commodity blow out that eventually died during the credit crunch. 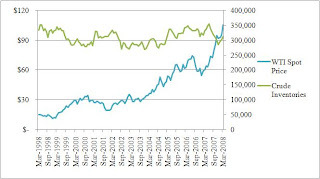 But it wasn't all speculation: as Robert Murphy points out at the excellent MasterResource energy blog, a real speculative bubble would have sent supply and inventories soaring - but they didn't, as shown in the above chart from his post. So the collapse in price may well have been due to a plain old collapse in demand: further evidence of the economic whiplash the global economy experienced through the latter part of 2008. But if he's right (and it makes sense to me), then even a weak recovery in the global economy in the latter half of this year (all those stimulus packages have to stimulate something) will cause a rapid reversal in the trend price of oil (and gas for that matter). Add in the horrific increases in money supply now underway and the scene is set for an economic flip flop from imminent deflation to nascent hyperinflation driven by the price of oil. And it gets worse: we have witnessed unprecedented 'demand destruction' in relation to energy demand over the past six months. but the story not being told is that of 'supply destruction'. As Bob Hirsch (with whom I have worked) and Matt Simmons point out in a recent, fascinating debate on nearterm energy prospects, low prices have lead not only to the mothballing of renewable energy projects, but also to the mothballing of oil and gas exploration and development projects. So when demand does pick up, we won't even be able to get back to the status quo ante without a massive hike in investment ... and prices. Something tells me the Russians have spotted all this, hence their belligerence over gas to the Ukraine etc. Like I said before, now's the time for the Irish Government to be locking in relatively low cost futures contracts for oil. And with wind power generation falling at times to less than 1% of installed capacity (as it did at 15.45 on 4th January just past), we need to rapidly source fully dispatchable power generators. I wonder are there any decommissioned nuclear submarines or aircraft carriers on eBay we could plug into the grid ...? Tony O'Reilly's decision to step down as a director of Waterford Wedgewood got me thinking about directors and their liabilities. During the boom years we have built up a body of legislation which uniquely assumes that directors of companies are guilty until proven innocent when it comes to their companies experiencing difficulties. As with so much similar legislation (e.g. : minumum wages, working conditions) there is an unhealthy dose of economic wishful thinking driving the spirit and letter of these particular laws: the kind that assumes actions don't have any unforeseen consequences, and incentives don't really count. Maybe on Planet Partnership. Back in the real world, we can identify yet another built-in-destabiliser in the Irish economy. This time, it is one that says to any would be entrepreneur, 'angel' investor/director, or seasoned executive with non-director potential DON'T RISK IT. Leave directorships and all that messy, risky business to the poor patsies who don't have any choice: sure the Office of the Director of Corporate Enforcement (real business-friendly that) will put manners on them. It's a destabiliser which also says: if there is the slightest doubt your business won't survive do everything NOW to avoid that outcome and a trip to the High Court (where you will be guilty until proven innocent) by laying off staff, screwing suppliers and borrowing as little as possible. Any wonder that the latest NCB Services Index shows employment intentions on the part of service sector employers falling off a cliff. (f) in the case of a director of an insolvent company, failure to file all outstanding annual returns on request and the company is struck off the register of companies as a result. Looking at yesterday's end of year Exchequer Returns, I'm beginning to wonder what the definition of 'reckless governing' might look like. Maybe we need an Office of the Director of Political Enforcement? Investing in the formation of people and developing a specific and well-integrated culture of enterprise would seem at present to be the right approach in the medium and long term. If economic activities require a favourable context in order to develop, this must not distract attention from the need to generate revenue. While it has been rightly emphasized that increasing per capita income cannot be the ultimate goal of political and economic activity, it is still an important means of attaining the objective of the fight against hunger and absolute poverty. Hence, the illusion that a policy of mere redistribution of existing wealth can definitively resolve the problem must be set aside. In a modern economy, the value of assets is utterly dependent on the capacity to generate revenue in the present and the future. Wealth creation therefore becomes an inescapable duty, which must be kept in mind if the fight against material poverty is to be effective in the long term. Every restriction on our liberties - our right to speak, write, criticize and offend as we please, to act and organize in opposition to the government of the day, to embarrass it and to show it up by forcing it to look into the mirror of its own leaked secrets - must be resisted. We cannot afford to believe any government’s protestations that it is acting in good faith and will safeguard the confidentiality of any information it extracts from us. Public safety and national security are never sufficient reasons for restricting the freedom of the citizens. The primary duty of the state is to safeguard our freedom against internal and external threats. The primary duty of an informed citizenry is to limit the domain of the state - to keep the government under control and to prevent it from becoming a threat to our liberties. 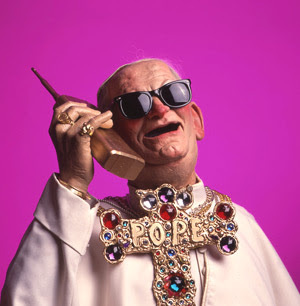 Of course, to go there the Pope would have to rescind the ludicrous doctrine of Papal Infallibility 'invented' in the late 19th Century if he really wants to defend freedom (and peace and prosperity). As the doctrine's greatest critic at the time, the Catholic Lord Acton observed: 'Power tends to corrupt, and absolute power corrupts absolutely'. That's something to pray for. What is it about 3rd January? 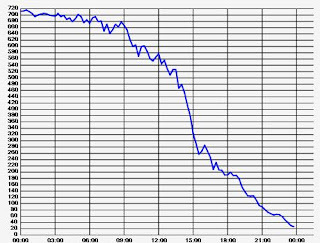 This day last year saw wind speeds drop to near zero across Ireland, with a resultant drop in electricity output from wind generation - as the chart shows. The same thing seems to be happening again, as reported by EirGrid. At 10.30am this morning, total wind generation had fallen to 63MW - that's just 6.8% of a total installed capacity of 920MW. At 2am on Friday 4th January 2008 last year total wind generation fell to 11MW - so we may not be at the bottom yet. In the last number of years there has been a rapid increase in installed WPG. Installed capacity has grown from 145 MW at the end of 2002 to the 920 MW as of 1 September 2008, with a further 1457 MW committed to connection. ... There remains very significant interest in the development of further WPG. Beyond committed projects, there is a 168 MW tranche of wind capacity being progressed under the Connection Offer Process. There are approximately 7 GW of wind applicants awaiting a connection offer. At the time of writing, the CER had published a proposed direction paper directing the system operator to process 3,900 MW of wind as part of Gate 3. This is in addition to a significant amount of conventional generation that is expected to be part of this Gate process. ... energy supplied from WPG has increased in recent years. In 2002, just 1.6% of Ireland’s electricity needs came from WPG. Despite rapid electricity demand growth in the interim period, at the end of 2007 the share provided by WPG, (of a larger demand figure), had grown to 7.1%. 2007 was considered to be a “poor” wind year in terms of nationwide average wind speeds. From consultation with industry it was found that this below average wind speed is within expected wind speed ranges. Wind conditions seem to be recovering so far in 2008. These are extraordinary numbers - and paint a worrying picture given the Government's ideological goal of generating 33% of electricity from renewables by 2020. According to EirGrid, current projections estimate that 4371 MW of wind and other renewables would have to be connected by 2020 to meet the 33% target. This would rise to 5405 MW to achieve a 40% target in 2020. Mostly from wind - which tends not to blow a lot this time of year. Sure, membership of the euro has protected us to a degree from the fate that has befallen Iceland (so far) - but then again, if we hadn't been in the eurozone it is unlikely we would have experienced the property bubble that is still dragging down the economy. What about other benefits of euro membership? We were lead to believe that a greater integration between the Irish and other eurozone economies would provide a significant boost to investment, employment and wealth. The evidence suggests otherwise. The performance record of our finest investment managers over one, three, five and 10 years can be described as nothing less than dreadful. They walked your money into a severe bear market not once but twice in just eight years. They ignored the lessons of history and the ferocity of a secular bear and they compounded the problem through the dismissal of cyclical indicators that warned of impending trouble a year ago. Charlie calls for heads to role - I'd go further: let's shut down the ISEQ and give it a decent burial. We have a stock market that is unfit for purpose: let growth-minded Irish businesses raise money in the UK, French or German stock markets. And let's ensure that no future generation of Irish pensioners and investors are ever again lead to the financial slaughter by self-serving, lazy Irish investment 'managers'. All that said, I am still a fan of the euro and Ireland's participation in the eurozone. We may now be a nation with a great future behind us, but the economic potential for the eurozone still exists. I believe the euro can provide the foundation for a single market driven by free trade between citizens and companies, creating employment and wealth for all of Europe's citizens. But it is only the foundation - the walls and ceiling will have to come from a genuine commitment to reducing the barriers to trade, investment and growth within Europe. And a start might be to look anywhere but the ISEQ for investment opportunities in the year ahead.